Chicago turns something out of nothing. It is not the city itself that does this, but the people within it, homegrown or recently transplanted. Chicago gives artists and other creatives the opportunity to build from the ground up, allowing them to not only visualize their dreams but to actualize them. Although these artists are often lacking in the traditional market forces (as in a print and money-driven economy influencing who gets the media attention and higher-valued work), the size of the city and the abundant and underutilized spaces allow creatives to build projects with their own visions, usually with little to no financing involved. 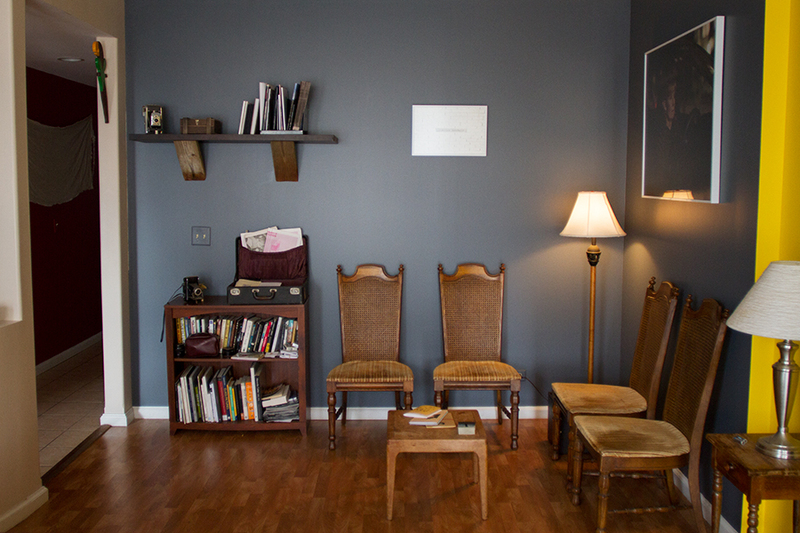 This makes Chicago a fertile ground for creative projects such as Matt Austin’s The Perch. Part underground dinner party, part printing press, and part collaborative artistic social experiment, The Perch could only be born in a city like Chicago. Austin’s funds are considerably low. The project takes place in his own home. All of the furniture used for the project (a massive and beautifully constructed dining table, thick and hard-backed chairs and benches that guests can carve on) was built using salvaged materials from places like the ReBuilding Exchange or the Illinois Holocaust Museum & Education Center. “This has zero revenue,” Austin makes a point of clarifying. And yet, he continues, not deterred. Based in Pilsen, the space (everything from the windowsills to the blue and yellow walls) was renovated by Austin starting over a year ago when he moved in. Living in the space further incubated his idea to create something that fueled his artistic practice as a photographer, his interest in building, and his desire to meet and interact with creative and new people in the art world. "It just helped me realize how much opportunity there was for people to engage with," he began. "It came out of this interest of building things and repairing the place. It became this project of nurturing a space and turning it into something." Austin teaches at the School of the Art Institute in its Early College Program and at Senn High School with an outreach program through the Museum of Contemporary Photography. Since beginning his project, Austin has hosted four dinners, about one per month, all attended by a variety of interesting thinkers. The first dinner was the most unique and included guests such as his boss at the Holocaust Museum, a former mentor from college, his brother&apos;s friend from school, and his first philosophy professor from Iowa. 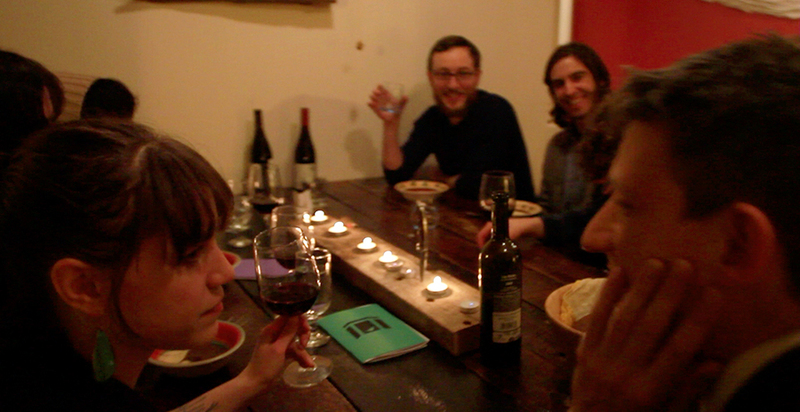 Each dinner is based on a prompt. One dinner asked guests to mark their creative progress and the discussion turned into one familiar for many working in creative fields: what they want to do versus what they actually do. The dinner serves as an in-between for people, asking relevant questions to their interests and artistic practices and challenging them to explore their work and interaction with the local and broader artistic communities. "The benefit of challenges, although they&apos;ll make you uncomfortable sometimes, it&apos;s about working through them,” Austin said. “That&apos;s how I&apos;ve designed these dinners. I provide a challenge for people to work with." In addition to hosting dinners, Austin also aims to create books for various artists, turning the Perch into something of a printing press. Austin provides labor and materials for the project. The first artist chosen was Todd Diederich. The project for Diederich’s “Luminous Flux” photography book has already surpassed its Kickstarter goal. The book project was almost immediately successful, signaling not only the level of support surrounding Diederich’s strong and charismatic work, but also the importance of the project as a whole. Who will provide these sorts of opportunities in this city unless the people within the city do it themselves? There is a reason why spaces like Austin’s thrive in Chicago. More apparent than anything else, it is this drive to create something personal and real. These projects are tangible, even if their longevity is up in the air. "The nature of Chicago is smallness, but it is still looked at as one of the more active and important cities,” Austin said. “It&apos;s that blend that makes this possible." This is the beauty of Chicago. Creative freedom is important. This is not just saying that the person could not have been creative without the city. They could be creative anywhere. Rather, the city allows those with a creative bent the opportunity to explore ideas in a way that is not possible almost anywhere else. Whether it is the extra time, space, or smaller market, by founding projects like The Perch, artists can work and explore on their own terms.